GNU 750 is a Daimler COG5-40 (8485) with Willowbrook (3208) C35F body, and dates from 1939. It is preserved in the livery of Blue Bus Services (Tailby & George) who were based at Willington in Derbyshire. You’ll find more history on this company at Stephen Howarths website. Mr. & Mrs. Marshall made the decision to retire. After much speculation the operation of the Blue Bus Service passed from Tailby & George Ltd to the Derby Corporation. This vehicle was part of The Quantock Motors collection but Stephen Morris is down sizing and selling many of his vehicles. This one was for sale in June 2011 for £25,000. It has been sold to Lithuania. You can see pictures of it in Lithuania here http://fotobus.msk.ru/ It appears that the coach will operate from central Kaunas to Urmas, which is a massive out of town shopping complex. The above picture was taking in April 2010 when the vehicle was in service on the Quantock Motors gala weekend. It is seen at Bishop’s Lydeard entering the Quantock Motors site. Note the Blue Bus Services badge on the radiator. What a gem. For English on the link, press the little union flag top right. What a beautiful coach. Strange, though, that it only had the 5-cylinder Gardner engine. I wish it well in Lithuania, but admit to some qualms about such loving care being lavished on it. Fingers crossed! The CVD6 was the most common post-war coach, and then the CVG6. How common was the COG6 before the war, though? Until the Regent III/PD2 era, the 7 litre 5LW was thought adequate for single deckers. Only Tilling parsimony allowed the 5LW to flourish after the war. It seems a shame that this gem as Joe calls it is no longer in the country where I presume it spent the last sixty odd years, another loss to the UK. Very nice shot by the way, never seen that done with a bus before. A couple of other shots of this coach may be found in the 1968 Halifax Parade gallery, when the livery was slightly different. 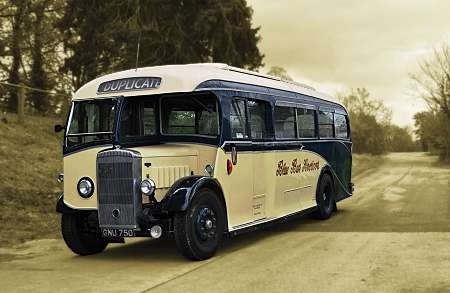 The 8.6 litre Daimler CD6 engine proved to be less than dependable for double deck work, and became instead the standard option for CV saloons up to the early 1950s. Post WW2, the 5LW engine was certainly not restricted to Bristol buses. Daimler offered a CVG5 variant which was taken by several operators. The 5LW was specified for many Guy Arab III machines, single and double deck, and it appeared in Dennis and Tilling Stevens buses also. In addition, this engine was offered in several makes of goods chassis, and for marine and industrial purposes. The 5LW did not depend upon Bristol for its post war survival. In its final form as the 5LW/20 it developed 100bhp at 1700 rpm, though, by that time, it was no longer offered in bus chassis. 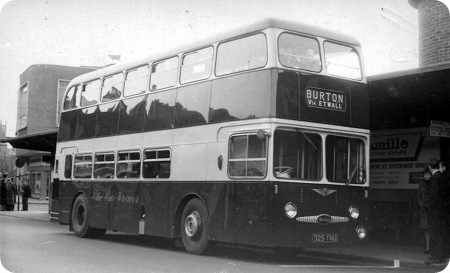 Bullocks of Featherstone (B&S Motor Services) – taken over by West Riding in 1950 – had five of this identical model Daimler (COG5/40), but managed to squeeze 39 seats into their Willowbrook bodies. The first, BWW 475 (202) was in fact a 1936/37 Commercial Show model. They were fine vehicles spoilt by the somewhat excessive engine vibration which necessitated body rebuilds after the war. Bodywork was generally lighter before the war than after, and the COG5 was Daimler’s most popular model for both single and double deck vehicles. Manchester’s COG5 double deckers were very successful, and so unsurprisingly their first postwar Daimlers were CVG5s. But with an unladen weight of around 8 tons these were less satisfactory, so CVG6s were then purchased until lighter bodywork became available in the mid-fifties (together with some lightweight chassis features arising from the development of the CLG5). CVG5s were then tried again, but were beaten by changed traffic conditions, so MCTD reverted to six-cylinder engines for the final batches. GNU 750 as an example of the COG5-40 had a more compact engine compartment and cab that the standard COG5. The 40 in the designation denoted the ability to accommodate 40 passengers. GNU also had a five speed gearbox. I drove this bus on several occasions during the early 1970s when it was in the ownership of John Horrocks. This is a very interesting view, Ken – thanks for posting. It reminds me of the "selective" tinting of school photographs in my primary school days. They were taken in black and white but could be enhanced on payment of a supplement. I’ve heard of – but don’t use – Photoshop. Is that program how you achieved this? There are several programs that will do this sort of task, Pete. Photoshop is the top of the range product for professional artshops and advertising agencies, and is extremely expensive – around £600. Cheaper alternatives are available, including Photoshop Elements and a free program called GIMP. I have an old Photoshop version and also the latest Serif Photoplus X6, which will do most of the things that most of us will need. Thanks for that, Roger. The program I use came with the slide scanner I bought a few years ago when converting my slides to digital. It’s called Photoimpression 6. I still use it for editing the digital photos: no point in buying one when I have one in hand! Or you could download the free program Photofiltre or use online photo editor Sumopaint, Pete. I was present on the 1st of May for this running day at Bishops Lydeard and was delighted to see GNU 750 being started up and brought into the ‘bus station’. The run went to Hestercombe House and Gardens but most of the gentlemen aboard (some eight or so of us) preferred to stand around the coach rather than visit the house and gardens. There was some playing around with the destination indicator and, as my photograph shows, some details of the coach were displayed. Would it have been usual practice – by Daimler, if no-one else – to include such information at the beginning or end of their destination rolls? Much as I enjoyed the run, a ride on the ex-Royal Blue Bristol L coach HOD 30 a little later proved to be a more luxurious affair. The Daimler message on the destination blind will almost certainly have been added during preservation. In any case, the destination blind would not have been provided by Daimler, who only built the chassis. Mention of "GNU 750 being started up" takes me back to Battersea Park May 1969, prior to the start of the HCVC London to Brighton run. GNU’s chief supporters were up bright and early, sprucing and polishing. I was tasked with taking the ‘tender vehicle’, ex Samuel Ledgard 2-stroke Foden ONW 2, across the bridge to pick up the rest of the party from their hotel. 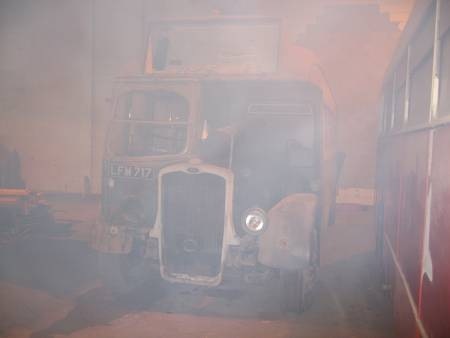 The only problem was that ONW’s exhaust pipe was pointing straight at the now gleaming GNU, and a cold start in that position would have resulted in a large deposit of soot! So GNU had to be started up and moved out of the way first. Funny how things stick in the mind. A couple of shots of Foden ONW 2 may be seen on the ‘Halifax Parade 1968’ gallery. Sadly, this interesting vehicle has since fallen victim to the breaker’s torch. Thanks, Peter, I half-suspected as much, but hadn’t seen anything like it on the other preserved buses in the Stephen Morris collection. One wonders why it was put there and only there. 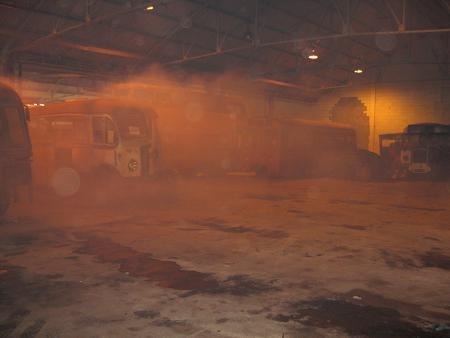 This picture reminds me of Percy Main depot on winter mornings. The garage staff had a cold start technique that required two men and a diesel soaked rag tightly wrapped around a stout piece of wood. The rag would be set alight, one of the staff would then turn over the engine while the other would hold the lighted rag at the end of the canister like air filter. Gardener engines are notoriously smoky when cold, and when you have several of them ticking over at once, the exhaust fumes would be billowing out of the open garage doors giving many a passer by the impression that the place was on fire. I recall, in the early ’60’s, going on a fortnight’s course in Brum and staying in digs next to Harborne Depot. Come 4.45am, every morning, there would be the cacophony of bus engines being started, ticking over, then driving out. It’s a wonder I ever succeeded at the course with lack of sleep! I lived near a trolleybus depot for some years – what bliss! At the risk of going severely ‘off piste’, this photo of an ex-Crosville L parked just to the right of the vehicles in my previous photo may evoke the atmosphere at the depot even more vividly. A nice photograph Andrejs but I note that it’s dated 2014. I wonder if the vehicle looks the same now! The above photograph was given to me by the ex Blue Bus Inspector the late Ken Baker, when I worked for Derby Borough Transport, and was in charge of the Blue Bus operation at Willington, before the fire. He had no idea where it was taken, but he thought it was in the Derbyshire Peak District somewhere, where as I thought it was in Yorkshire. Perhaps somebody will be able to identify the location? 120 JRB was unusual for a 30ft – long coach in that it was only fitted with 37 seats, the usual maximum being 41. Contemporary reports state that it was fitted with translucent panelling which could be lifted for ventilation. It was also fitted with an air operated pre-selector gearbox, and it was reported that it could travel at 55mph. This coach was the first vehicle to carry the “Wings” emblem in place of the “Blue Bus Services” fleet name. If anybody is interested I have a Blue Bus Services page on my website, which can be found at this link. I hope someone comes up with the location of 120 JRB. Good picture, possibly taken in Wirksworth, Derbyshire. You have set us a teaser as to where this is! The pale grey stone suggests that it is in the southern part of the Peak District- but where is/was there a Natwest Bank? Wirksworth doesn’t look right on Google Earth- goldish stone & brick- & has a big Natwest: this is/was a part time branch. I wondered about Youlgreave…..
Joe, Youlgeave (Pommy) hasn’t had a Natwest Bank, the stone is similar to both in fact all of the Peak District. Well the few bits that I can add having worked for National Provincial and later National Westminster Bank are that the picture was taken after February 1971 and the size of the Branch would suggest that it was an "Agency" open one/two days per week. These were attached to and run by much larger Branches so that would seem to indicate that it is not too far from a large town or city. Oh that I had my old Sorting Code book because with a bit of work you could eliminate possibilities using Google Earth! Sadly, we always had to destroy them. I’ve just researched Pateley Bridge because the road layout at the top of the hill is similar but the Bank is Barclays and too far around the bend. So not much help but any old Yorkshire/Derbyshire Bankers out there might get closer. A flash of inspiration suggested Bonsall. Have a look at Google maps. I think the picture was taken from an upstairs window of the Kings Head, looking down Yeoman Street. The end of the cottage in the distance is fairly distinctive. Well done Stephen- it is indeed: Yeoman St Bonsall. The shops have been prettified into houses and the bank is no more but looks much the same. The pub car park, probably once some cottages, has been improved: in fact the whole place looks smarter. It is possible that the pic was taken from the memorial plinth, but it was probably higher. I’ll stick to my guns, though, Roger, on the stone: it was always noticeable that the stone changed going south from squarish often goldish stones to this pale grey rubbley stuff, often found around those tiny sheep fields/pens. Compare say Baslow with here. I wonder were the coach is heading as the road out of Bonsal towards Brightgate is very narrow. My guess would be that it was either a trip to view the well-dressings (July) or a pub visit at the end of an organised sightseeing tour. Roger is right, Bonsall was the end of the line for buses (and still is). At the time it was North Western territory with a fairly regular service from Matlock, nowadays G & J Holmes and an hourly service during the day on weekdays. An amazing flash of inspiration, Stephen; I can’t fault it. Think of the chances that, from such a small group as us, someone would triumph! You shall have a gold star! O come on, Chris. There’s some shared brain power among us – and we’re probably all getting on a little bit now! Coming from the Peak District end of Sheffield, the whole PD is my (favoured) stomping ground. Now exiled in the south, Bonsall was a regular part of run out in the car I did when visiting aged (now dead) parents. I only ever went UP hill from Cromford and never had the perspective of this photo – looking down. While it’s true that there are some widely-travelled folk amongst us, it still surprises me how many questions thrown at the website are answered. I’ll compromise by awarding Stephen only a silver star, then – okay? I’ve played around on Streetview, and if you paste this link into your browser, you can see the scene as it is today when map loades drag and drop the little orange man to the Kings head at this Google maps link. Hy Hulley, now there’s a name from the Peak District, nearly had the variety of vehicles of Barton, some out of COF vehicles would be parked on open land opposite the garage in Baslow, now luxury flats are parked there ! The business is still operating as Hulley under the Woolicrofts ownership ex Silver Service of Darley Dale. In the 1978 Busus annual there is a good article on Peak District operators from the 30’s. Scrooge! I didn’t mean that Stephen didn’t deserve the Gold Star – I’ll reinstate it and take this opportunity to say Happy Christmas to ALL friends on this wonderful site. ………and I’ll second that, a Merry Christmas and a happy New Year to all. That must have been one of the last Freelines built – also one of the last Daimler 10.6 litre engines. Wonder if Blue Bus managed to acquire a stock chassis at a knock down price for being a loyal Daimler customer? The steering wheel position in the Freeline always looks too high although presumably the drivers seat was similarly raised to achieve the required min 6"/max 10" clearance between the top of the seat cushion and the underside of the steering wheel rim required by the Conditions of Fitness Regulations. When I said inspiration, I didn’t mean the miraculous sort (or sticking a pin in a map at random either)! I was just thinking of places I have visited that might fit, then checking them in Google. Roger mentioned Brightgate just to the north of Bonsall, and we have in fact camped in a very old static caravan at Brightgate farm a few times. Even in the prettified state that Joe referred to, Bonsall is a grey village and can look a bit dreary in anything less than brilliant sunshine. I think my inspiration was along the lines of "it looks grey enough to be Bonsall!" Stephen, The Barley Mow on the Slaley Rd out of Bonsall is a very good watering hole which has recently changed hands, good beer and food. It certainly wasn’t one of the last Freelines, I’m not sure when production officially ceased but Great Yarmouth took some in 1964 with ‘B’ registrations. It would have been, however, one of the very last Burlingham Seagull’s to the original design. By no means a unique combination and yes, all of them appeared to have very high steering wheel positions, what is not immediately apparent is that this one had three long panoramic windows on each side and one piece windscreens, not the horizontally divided opening type. I think Yelloway had some to this diagram also. Delivered in June 1959 only just in time for that years summer, I think that was the last season of this particular shape. If Blue Bus had waited till the following year, they could have had the Seagull 70 body, now that would have been a unique combination! Hulleys are indeed still operating, but I’ll have to look up their history. I think the link with Wooliscroft/Silver Service was short-lived and they had to be rescued by someone else. If what Chris says is true, then that would indeed make it the Seagull VII and 1959 was about as late as you could get. I know Hulley’s became independent of Wooliscroft but have no idea of the eventual (current) ownership. Some hazy reflection puts them back into the Hulley family but I could never swear to this. There is a history of Hulleys on their website http://www.hulleys-of-baslow.co.uk/ which explains everything. The fleet now looks very smart in a dignified blue and cream livery which was originally inspired by second hand purchases from South Notts. I am pretty sure the Great Yarmouth Freelines were the last, certainly for the home market. 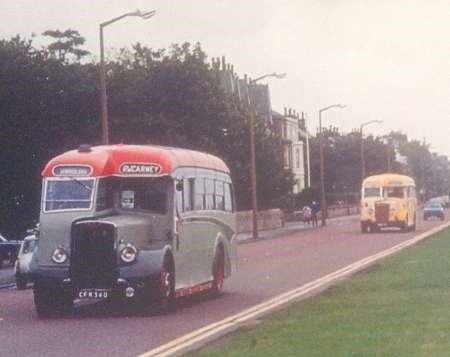 They were bought while Geoffrey Hilditch was the General Manager, a man who had very firm ideas on bus purchasing and as an engineer tended to go for high specification designs on the grounds they gave better pay-back in the long term. He took these principles to Halifax and then Leicester where he subsequently held the GM posts. It always seemed strange to me that while Daimler were very successful with their double deck designs, eg the CVG and the Fleetline, they were never as successful with single deckers. The Freeline was a well engineered chassis but on the heavy and expensive side at a time when the industry was moving to lighter weight and lower cost. The subsequent Roadliner seemed to be a disaster from the start. Premier Travel and Valliant of Ealing were also customers for the Seagull Mk VII, amongst others. The first Mk VII, on Leyland Tiger Cub chassis, appeared at the 1958 Commercial Motor Show in Seagull Coaches of Blackpool livery, just like the original Seagull at the 1950 show. Several of the Valliant examples plus all four Yelloway examples ended up with Premier Travel, joining the one they bought new, which made Premier Travel the largest operator of the type. Burlingham’s offering for underfloor engined coaches in 1960 remained the Seagull Mk VII, the Seagull 70 only appearing for the 1961 season, ie a year later than the similarly styled Seagull 60 for forward engined chassis appeared. I made several journeys in the Gt. Yarmouth Freelines in the early seventies when they were on hire to Eastern Counties and they were very pleasant vehicles to ride in – a sort of up market Bristol MW. I believe Yarmouth had a good line in hiring them to coach operators whose vehicles had broken down in the area. The only time I ever saw the Great Yarmouth Freelines was at Huntingdon St Bus Station, Nottingham in the mid sixties. One would sometimes appear as a summer Saturday extra on Trent’s Great Yarmouth service. At this time, Trent often hired in Norfolk Motor Services coaches as required – presumably the Freeline was part of this arrangement? Belated update on 120 JRB (have only just discovered your site) – am most impressed by how quickly the location of this shot was nailed down, incidentally! Lovely image of what was – arguably – the final Daimler-engined Freeline (Burwell & District had the other such chassis that could make the same claim to fame). The lack of window-pillars made quite a visual difference, certainly in the flesh. Stephen asks if anyone knows the whereabouts of Dr 18: am guessing we know of her early years in preservation and subsequent re-emergence in a Barnsley scrapyard (what DID happen, though?) – since then, Dr 18 has covered quite a few miles, changing hands along the way several times, until (last I heard) she was in a barn near Uttoxeter with several other vehicles (so, not far from her Willington home) awaiting her turn for restoration. Somewhere, I have two or three colour shots of her in this location. If and when I find them, I’ll scan and submit. Some 3 years on since the "turn" comment (11/08/12), the vehicle is still in the same shed in the same condition. Would feel that restoration really quite unlikely now. Freeline 120 JRB is indeed located near Uttoxeter together with CD650 SRB 425 and is owned by Mr Andy Mould. It is indeed the only ‘complete’ surviving Freeline in GB and is well worthy of restoration. It is mechanically sound but does need a full body restoration. It is now unique. How nice to hear this coach has been preserved. The last I heard was that it was rotting in a scrapyard in the Bradford area. 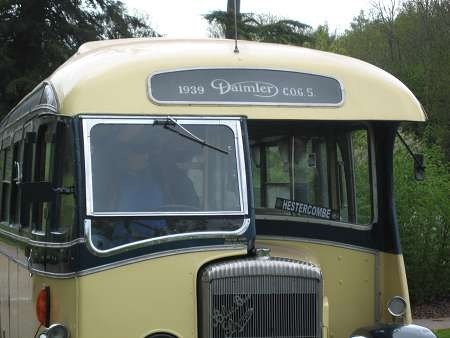 We had a"Blackpool Trip" every year in September and would always ask for this coach known as "Daimler 18" because our coach enthusiasts liked the sound of the powerful Daimler engine and the hissing of the air operated clutch. I have a painting of 120 JRB standing outside Repton Church. I remember we paid less than £1 per person for the coach (out for 20 hours on a 240 mile round trip) and a ticket to see Cliff Richard in Blackpool plus a tour of the illuminations. We also asked for "Frank". one of Blue Buses`s young drivers. I was kind of hoping you might shed some light on the whole Seagull Mk7 history as I am the owner of Blue Bus Dr18 120 JRB I can find very little other history on this period of Burlinghams activity and just wondered how many ‘plastic pigs’ were built, the body panelled entirely in fibreglass providing all the outline with a straight framed body must have been a brave step and taken a lot of development, although far from their finest hour, having restored BMS 415 many years ago I can fully appreciate how good they could be and 120 JRB is far from that build quality even evident after many years. So I would be keen on know just how many were built I am aware of 999 EAE was 7 body numbers apart but I am told two of those numbers were allocated but never used. Reference comment of Andy Mould 17/08/16. his restored coach BMS 415. Behind CFK 340 is BMS 415 returning from Manchester Museum 3rd of April 1982 location of photo is unknown any detail be gratefully accepted. Blue Bus Services was the operating name of Tailby & George who were located at Willington in Derbyshire. This bus was the 54th Fleetline chassis built its sister vehicle registration 324 YNU was the first production Fleetline chassis built numbered 60003 the three chassis before were all owned by Daimler and were number 60000 a demonstrator registration 7000 HP, 60001 an experimental chassis and 60002 a demonstration chassis. Blue Bus Services actually purchased the demonstrator 7000 HP after it had done its rounds but unfortunately it and many other buses were destroyed when the Willington bus depot burnt down in 1976. Yes a great loss, I have a rare ring binder bound book on Blue Bus by a small long gone concern known as Morley’s Bible and Book shop, Nottingham Rd, Ilkeston. from about 1978. Yes, I remember visiting the shop and knew the proprietor – John Moorley (spelt that way if I remember rightly). I worked for Blue Bus for 4 years as an apprentice engineer and left to go to Nottingham City Transport in 1971. It was a fantastic, varied fleet that always looked smart in the hand painted argyle blue and cream livery. Buses were properly cleaned and mopped almost daily, a standard that was probably higher than many current operators achieve nowadays. If I can help anyone who wants to know anything about the company or their buses I will, just ask, as I was proud to work there, and it set the scene for the vehicle standards I have worked to achieve ever since as an Engineering Director. Incidentally, my last role was the accountability for engineering and maintenance for a 70,000 bus and coach fleet in the USA and Canada, including the ubiquitous Greyhound fleet. Not bad for a Blue Bus lad from the wilds of Willington! Big trees from little (blue) acorns grow! Perhaps you could write a potted history for the ARTICLES section – I’m sure we’d all be interested, especially in any amusing incidents. I think that 325 YNU was one of 10 pre production chassis, another of which was PMT L899 which had a virtually identical low height Northern Counties body and was delivered in 1962. L899 had chassis number 60027 which seems a bit high for a pre production chassis but that was what I was told whilst at PMT. Moorleys shop is certainly long gone but the company survives as a Print and Publishing company. I have retired but still take an interest in the business. Visit http://www.moorleys.co.uk for both company history and current titles published. The bus is in a Street in Sunderland, it is the number 23, destination Roker. I am just trying to find out what year’s this bus was on the road, and if possibly find out when it was in Sunderland, then we can see if we can match it to the years my Dad was a driver. I hope someone can help me a little with this. Hi Lorna – well, 7000 HP was a Daimler "demonstrator" – ie one loaned to any interested operator to see if they would like to order some after a short trial. If your picture is in Sunderland it is likely to have been on loan to the Corporation for a very short spell – it was new in 1960 and was sold by Daimler in 1966 so the Sunderland loan must have been sometime in that very wide window. Can anyone narrow it down to a closer date? Just to add to Chris’s comment, indeed this vehicle was a demonstrator and went to many operators and spent a considerable time with Birmingham City Transport. The picture here: http://www.flickr.com/ and date in text may help further. Lorna, Chris: As 7000 HP was a demonstration vehicle, and the first of Sunderland’s own Fleetlines arrived towards the end of 1962, I would suggest the photo could have been taken in 1961 or 1962. I also have a photo of 7000 HP in Sunderland on route 23 (Thorney Close). It’s in it’s demonstration livery similar to Birmingham Corporation’s, but has Sunderland Corporation showing on the top of the near side windscreen. Unfortunately it is not dated but looks to be 1961 or 1962 as suggested. The engine bonnet cover does not look to be the extended one fitted when a wider Cummins engine was installed as a mobile test bed, so I do not think it was 1965/6, at least. There is mention several times in these files of Geoff Hilditch. A former boss of mine (in Southampton City Council) once told me a story regarding the advent of the Dennis Dominator. My boss and Mr Hilditch had both worked for the same Council at one time and appear to have still been in contact when the Dominator entered the arena. I’d have put this entry under the Dennis Dominator, but it doesn’t seem to appear in the menu on the right, so I’ll file it under Daimler instead. Any readers who want something approaching the truth about how we came to have the Dominator, can find a suitable story on the "Encyclopaedia" website. There are some detail differences between what appears there and what my boss told me, but you’d expect that! Suffice to say that the Dominator was virtually a clone of the Fleetline. Leyland, for their own reasons, didn’t want to sell Fleetlines to Mr Hilditch in the numbers he wanted to buy, and over the number of years he wanted to buy them. Leyland’s arrogance has been mentioned in these files, and it isn’t just relating to their bus production. …..but the sad thing is that we all use Leyland as a short hand for British Leyland Motor Corporation who made the proud and historic marque a toxic name and a laughing stock. Even through the bleak years, really good vehicles were produced AN68s, Leopards and Reliances to name but three. Any problems with these were mainly as a result of BLMC ownership which starved Leyland Bus of money for R & D – and possibly quality control. [Tigers, Titans and Olympians were all delayed years because of this starvation.] We can only gasp in astonishment at the arrogance and ignorance that forced the Leyland National Mark 1 on an unsuspecting market and public – and at the expense of the Bristol RE! Mention of the Dennis Dominator brings to mind the Dennis test bed for this model which was a former Leeds Daimler CVGLX/30 517 7517 UA Dating from 1959 and carrying a Roe body the bus was finished in a red livery and toured operators prior to production commencing. In its new guise it was re engined and given Voith transmission and a Loline rear axle. It was eventually bought by Leicester for spares.